This thread describes how to include a pileup model in the model expression when fitting data in Sherpa. The Background Information section contains information on how the data should be processed in order to run this thread. A comparison, for low pileup fractions, of the pileup models in Sherpa and XSpec with that in ISIS. Experience with the jdpileup model has chiefly been for on-axis point sources, and in this thread, this condition is assumed. Even when analyzing piled data from a point-source, keep in mind that events in the core of the Point Spread Function (PSF) may be severely piled up while events in the PSF wings may be essentially unpiled, so generally, the fraction of the measuring aperture deemed to be piled up (f model parameter) is less than 1. Reprocess the data and apply the standard event filtering to create a level=2 event file; this is illustrated in the Create a New Level=2 Event File thread. Extract a source spectrum from a circular region, usually about 2 arcsec in radius (e.g. by following the Extract Spectrum and Response Files for a Pointlike Source). Use the pileup model in Sherpa to fit a spectral model. For a detailed discussion of the model, see Davis (2001). An afterglow is the residual charge from the interaction of a cosmic ray in a CCD. Standard data processing (SDP, aka "the pipeline") uses the tool acis_detect_afterglow to flag possible cosmic ray events in the level 1 event file; these are then filtered out in the level 2 event file. It has been determined, however, that 3-5% of the valid source photons may be rejected from diffracted spectra. These rejections, though a small fraction of the total events, are systematic and non-uniform. In order to accurately model the pileup, it is necessary to remove this correction so that no source photons are eliminated from the event file. Read the Pileup Talk for more information, in particular Data Preparation and Caveats. The Remove the acis_detect_afterglow correction thread shows how to undo the afterglow filtering. A new, more precise method for identifying afterglow events was introduced to SDP at version DS 7.4.0. If your data was processed with DS 7.4.0 or later, acis_detect_afterglow was not run in the pipeline. The new hot pixel tools are more judicious with respect to throwing away piled source events. Users should be able to analyze the data without having to unfilter events first. The Get Started section of the Remove the acis_detect_afterglow correction thread shows how to check the processing version used for your data. The data files are available in sherpa.tar.gz, as explained in the Sherpa Getting Started thread. If the background file is not referenced in the header of source_bin10.pi, you can manually load the background with load_bkg. 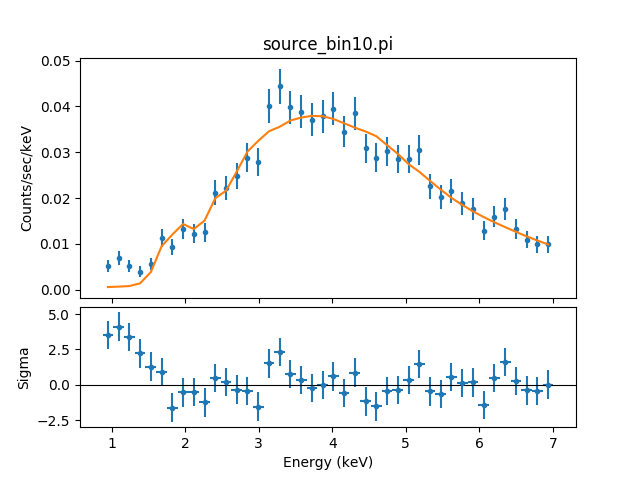 The data are plotted in energy space since the instrument response provides the information necessary for the computation of the number of predicted counts in each detector bin; Figure 1 shows the resulting plot. Plot of background-subtracted source spectrum. Note that the pileup correction will include the entire available energy information regardless of the specified filter. The fit statistics, however, are calculated only on the specified bins. Figure 2 shows the filtered data, which has an energy range of 1-7 keV. See the Choosing an Energy Filter why topic for help in picking a range. Plot of background-subtracted, energy-filtered source spectrum. Since we have background-subtracted the data (rather than fitting it simultaneously), it is only necessary to create a source model expression. We model this source with a power-law (xspowerlaw) absorbed by the interstellar medium (xswabs). Note that since the model contains multiple components, the Sherpa guess command cannot be used to estimate the initial parameter values for the full model expression based on the data; each model component must be considered separately. To have Sherpa automatically query for the initial parameter values when a model is established, set 'paramprompt(True)' (it is 'False' by default). In this thread, however, we allow it to vary during the fit. alpha parameterizes "grade migration" in the detector, and represents the probability, per photon count greater than one, that the piled event is not rejected by the spacecraft software as a "bad event". Specifically, if n photons are piled together in a single frame, the probability of them being retained (as a single photon event with their summed energy) is given by alpha(n-1). alpha is the parameter most likely to be allowed to vary in a fit. Grade correction for single photon detection, i.e. a fraction g0 of single photon events will be retained as good grades. In practice, this should be frozen to unity (the default) in any fit. The fraction of events in the source extraction region to which pileup will be applied. A typical value is approximately 0.95, and it should always be >0.85. f is the second most likely parameter, after alpha, to be allowed to vary in a fit. Divide the model counts among n regions, to which the pileup model will be applied independently. This should be approximately the number of 3×3 pixel islands in the extracted spectra; for point sources, it is unity (the default). This should remain a frozen parameter in any fit. This parameter is a fraction ≤1 that multiplies the frame exposure time to create a shorter, effective frame exposure time. Users should set and freeze fracexp to the FRACEXPO value from the ARF file, and set the frame exposure time via the ftime parameter only. FRACEXPO is a value between zero and one, which indicates the fractional time that a region was exposed by a detector (e.g., it is 1.0 on chip, and drops in chip gaps). Information on using this parameter to model novel deadtime effects is available in the The Chandra ABC Guide to Pileup. The nterms parameter represents the number of photons considered for pileup in a single frame. This should be left frozen at its default value of 30. In other words, the expansion of the model will include terms corresponding to 0, 1, 2, ... , 28, 29, and 30 photon events landing in the same extraction region during the same frame time. To find a global minimum for the fit to the data, we first choose to use one of the simpler fit optimization methods: Neldermead. This will allow for a quick fit, but may require some "hands-on" work afterwards. The parameter space of models which include a pileup model component is very complex and presents a challenge to the search and fitting algorithm. By using the Neldermead method, we are settling for finding a local minimum; now one should examine the solution, check the error bars, find a new minimum, refit, etc. Another option is to use a different optimization method, one which will start from several initial parameter settings and explore—in a more consistent way—the entire parameter space; the "moncar" method that uses random starting locations can be used in Sherpa. Now we change the method to Monte Carlo and re-run the fit to see how the results change. Note that we start at the results obtained by Neldermead, but you could reset the model parameters before continuing with the reset() command, if desired. The table lists the best-fit values for the model parameters, as well as the upper and lower bounds on each of them; 'jdp.alpha' does not have an upper bound, so it is unconstrained towards the hard maximum. Notice that the conf() command is preceded by 'set_conf_opt('fast', False)' to explicitly use the current optimization method (Neldermead) instead of LevMar, the method used by confidence when "fast"=False. The final plot is show in Figure 3. Plot of the model fit to the source spectrum, with residuals. This command prints the pileup fractions from the most recent fit. From left to right, the columns report the number of piled photons, percentage of that number of photons in the pileup region, and percentage of that number of piled photons in the total events. The fraction of pileup in the observation is printed after the breakdown. The next paragraph analyzes the above results, which should clarify this explanation. In this example, the first row indicates that ~26% of the frames contained a single photon in the pileup region and ~78% of the events were single-photon events. The second row shows that ~27% of the frames contained 2 photons in the pileup region and ~19% of the events were due to 2 photons, and so forth. For this observation, the total pileup fraction is ~22%. These results may then be restored in a later session with the restore command.